The history of Afro-Canadians in Nova Scotia goes back well over two centuries. 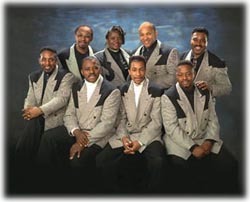 One of Canada's premier gospel groups, the Nova Scotia based Gospel Heirs, formed in 1976 as a four piece group and later expanded to eight members. They have taken the gospel music of their roots, mixed it with the rhythm and blues sounds of the '60s and '70s and added an element of '90s dance music to produce a modern gospel sound that is overwhelming. Their presentation of contemporary gospel music reflects the group's unique identity and their strong commitment to a great Nova Scotian musical heritage. When the group started performing they were known as the Gospelaires but this was later changed to The Gospel Heirs. With roots going back 200 years, they follow the fine Nova Scotia tradition of family bands. The group is comprised of two father and son pairs, a husband and wife team, a cousin and a family friend. Each of the members of the group has a musical background in the church or in secular bands. As a group they believe that their coming together represents a wonderful opportunity to fully share the excitement of gospel music with audiences everywhere. All members reside in North Preston, Canada's largest black community, and all attend St. Thomas United Baptist Church in their community. The Gospel Heirs commitment to their faith gives them the temperament and drive to maintain their focus on performing gospel music to audiences worldwide. plays lead guitar and is a lead vocalist. performs lead and background vocals and plays percussion. performs lead and background vocals and plays piano and synthesizer. performs lead and background vocals. performs lead vocals and plays saxophone. is a background vocalist and principal percussionist. plays bass guitar and performs background vocals.